When did Americans start spelling it "color"? Usually I wouldn't apologize for a lapse in posting, since I think an obligation to apologize acts as block to actually making another post. But in this case, my hiatus is (loosely) related to the topic. 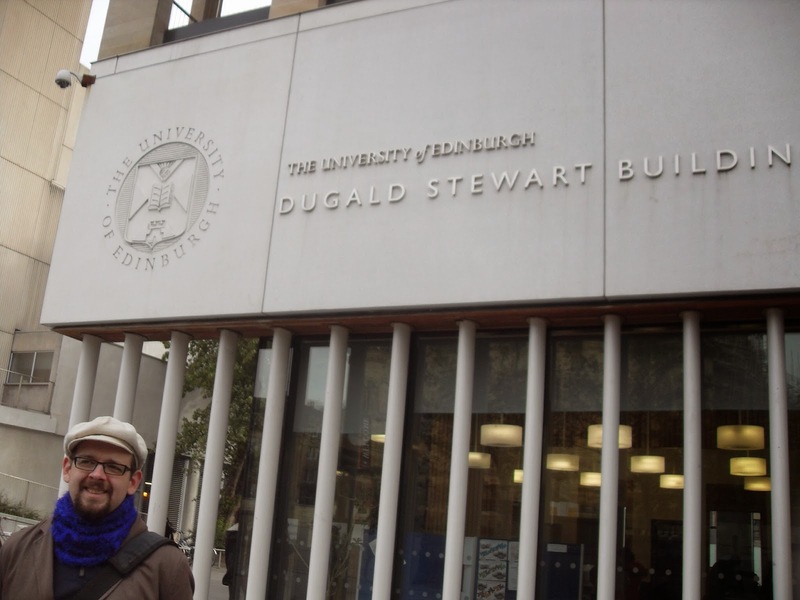 In September, I defended my dissertation (check it out here if you're so inclined), then hopped on a plane and immigrated to Scotland to start a job as a lecturer in Sociolinguistics at the University of Edinburgh! The sun was in my eyes. I was feeling very excited. It's been a fun experience exploring the new cultural landscape. As is usually the case, the differences are more noticeable and surprising than the similarities, but I'm managing more or less. I'm crossing streets with confidence that I know which way the cars are coming from, participating in rounds at pubs (though I'm still not sure I'm doing that right), and thanking the bus driver, which is nice enough to do in the States, is apparently more obligatory here. One thing I was told by another recent US immigrant to the UK wis that that students appreciate attempts at accommodation to British spelling. So, I'm giving that a shot too, although I'm sure I slip up a bunch, since I'm a very poor copy editor. However, out of passing curiosity, I decided to look at the historical trends in these spelling differences in the Google ngrams, and the patterns seemed interesting enough to warrant this blog post. First, looking at the American English data for <color> and <colour> there's a very nice and clear cross over from to around 1845, which is about 20 years after Webster's 1828 dictionary, which according to Wikipedia is what we have to blame these differences on. Once you start trying to add more <-or ~ -our> to the graph, it gets chaotic fast, so instead of plotting out each word, I'll plot out the percent of <-or> spelling using Google ngram's handy arithmetic functions. (I've also included color/color, just to anchor the top of the range at 100%) I don't think I should have been, but I was a bit surprised with the uniformity with which the <-or> spelling replaced the <-our> spelling across all of these words. The trends seems to kick off around the 1820s, consistent with blaming it on Webster's dictionary, and increased till reaching its plateau around 1860. But of course, <-or ~ -our> spelling isn't the only difference between British and American systems. The next set of consistent spelling differences involve <-er ~ -re>. Here are those words plotted out, with <color ~ colour> and <humor ~ humour>left in there as a representative items of the <-or ~ -our> set. So, it seems like there is a similar uniformity within the <-er ~ -re> words (maybe saber and theater are lagging behind) but the <-re→-er> replacement is offset from the <-our→-or> by about 60 years or so. Of course, I shouldn't have been surprised, because I know how a little bit about language change, but it was fun to see this thing that I think of being a uniform "American Spelling" is actually the result of multiple changes that didn't happen all at the same time. Just for fun, I took a look at what these patterns look like in British English. So, it looks like there might be a bit of a creep of American spellings into British English, but interestingly, the particular alternations aren't differentiated. So while the end product of "American Spelling" appears to be the result of an accumulation of different changes, the borrowing of American spelling into British English is being done holistically.